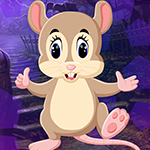 G4K An Innocent Mouse Escape is another point & click escape game developed by Games4King. Imagine that an innocent mouse got trapped in a cage. It is your duty to rescue this innocent mouse. It will help you to find the hidden clues in the form of colours and numbers and to find the items where the innocent mouse is to save this rodent. Find them all and solve all puzzles to free the innocent mouse. Good luck and have fun! Another live game... will steal some time to play. Three items in the first scenes, all hidden (and no hotspots are shown in these games). Doh, I was stuck for a minute after entering the hall with chest, jewel/candy puzzles. Word puzzle is next to do. Oh hi Alpha! Sure you'll beat me with this but no problem! Tsss, I'm already behind. The 4# clue is not for that plain 4# puzzle and not for the dial/flower box in acorn scene, so maybe for the mushrooms? Still fussing around with that. Holy Moly, I'm stuck with that darn 4# clue and nowhere to use it! Finally it worked, click the mushrooms as many times as the clue says. I swear I had tried that a hundred times before! now where to use that barrel colour hint...? My pleasure. Maybe I'll have some more time to play, let's see. Okay, things are rolling here. Sometimes I forget to pick up an item, so it takes me some time to finish. But I think I'll make it. Thanks for sharing some time together and posting those games. CU! That candy slider gets me - like in those good old EightGames times. Man!